Welcome to our October inspiration challenge from The House That Stamps Built. 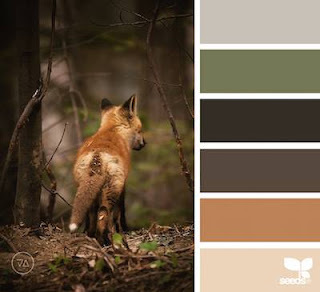 I am so inspired by wildlife in more ways than just card creation. I have such a respect for all those creatures and critters that live in the wild - including the nuisence ones like squirrels. I love to watch them play and chase each other around in the leaves. This inspiration gave me a perfect opportunity to play with this fabulous stamp from Repeat Impressions - RI#4210-J "Grey Squirrels". I also used RI#3313-"Oak Leaf" and 3306-I "Falling Leaves". Everything was colored with Copic Markers. The sentiment is a partial stamp from RI#9717-C "Happy Hello". For additional texture and interest, I added a dry embossed piece of cs in dark brown behind the open oval die cut window and the little dots are from my Viva Pearl pen in gold. What will you create using this inspiration image? Check out THE HOUSE for all the details. Please visit my team mates' blogs....they have some fabulous inspiration creations to show you. 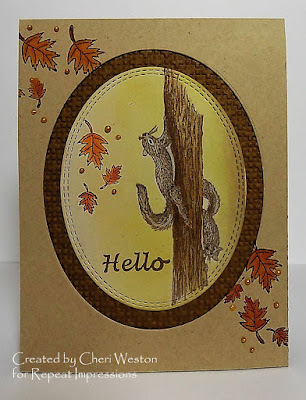 Beautiful Fall card and that squirrel is perfect! WOW! SS this is so cute and so true to nature. Love the colouring and the added leaves. Looks so good with the oval background. This is just adorable, the squirrel is too cute, like the added leaves and that oval is great too! Enjoy your day! This is perfect for the challenge, Cheri, and SO pretty! Your oval framing is an elegant look, and I can't wait to give it a try! Thanks for sharing and inspiring! Love this - and you know I don't remember seeing this cute squirrel. love the oval and additional elements you used. 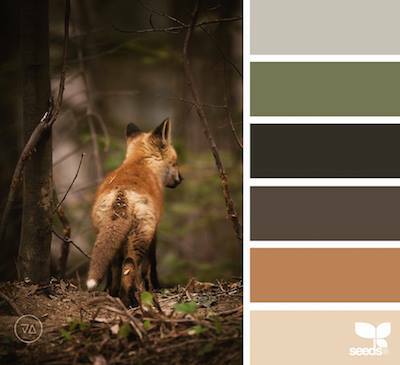 Great wildlife take on this inspiration! - the fall leaves stamp is one of my favorites! Cheri, this card is just stunning! I've never noticed this stamp in the store; I am definitely going to have to look for it. Love how you framed it and how you finished everything off with the leaves and the nuvo dots. Lovin' these cute squirrels! Great take on the challenge!